YO KC remember all those quarterbacks you got from the Niners? Time for the trades to flow the other way, let's begin with Houston. Justin Houston on one edge and Nick Bosa or Josh Allen on the other. I'm simply surprised there's a trade market for him at 30. I think you can still get value out of Houston even at 30.. you won't get an every down player but someone that can help put pressure on the QB in key downs.. but not at $15M a year. Which is why I'm surprised there's trade value. Looking at his contract a lot of it isn't guaranteed so I'm sure the cap hit can easily come down with a restructure to guaranteed. I also see no reason a team would balk at $15m a year for Houston. For a short term deal, he would easily get something in that ballpark on the free agent market. Carlos Dunlap signed an extension last year that got him $13m/year for his age 29-31 seasons, and he's reached double digits sacks only once in his career. 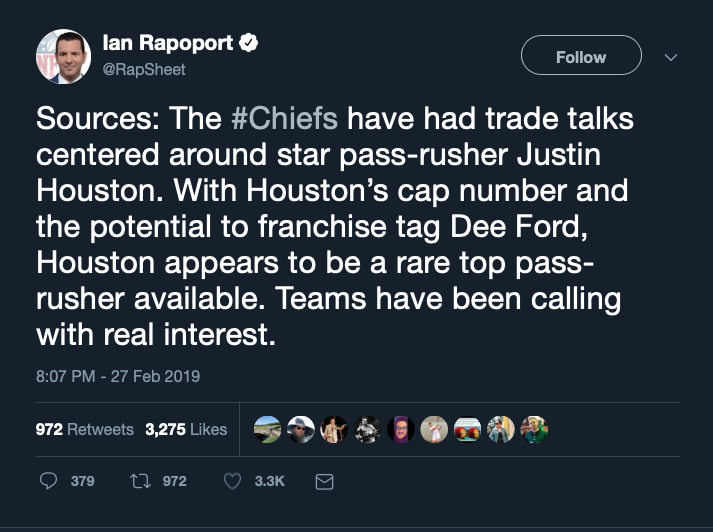 The Raiders should probably be the team most interested, but little chance the Chiefs trade him in division if they have other options. 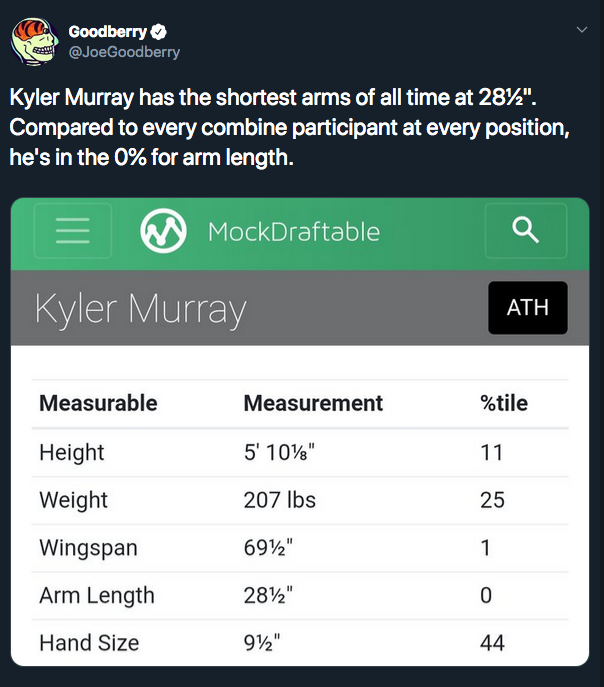 Kyler Murray measured 5-10 and 1/8th and 207 pounds, numbers that are very good for him. Uh, Jason Witten has quit ESPN and is going back to the Cowboys to play for another year. Bring on the Russell Wilson comparisons, eh? Exactly where he needed to be. Now ESPN's really going to try to convince Peyton Manning to join MNF. Yay, he already has 2 receptions vs the Giants since his reinstatement. So I've been watching some Kyler Murray, and with every short QB that has come along, I have resisted the Russell Wilson comparison. With Murray, from what I've seen so far (may change yet), the Russell Wilson comparisons are right on the dot. Whether he can be that good as a pro or not is another question, but in terms of where his strengths and weaknesses lie, Wilson is the most direct analogue based on my video watching so far. Honestly, I'm fine with Booger getting a seat in the booth with Joe Tess and seeing how that goes for a season. But ESPN will f**k it up because that's what they do. So that one Manziel AAF tweet may have been fake, but it turns out to be somewhat close to reality: the AAF chairman has spoken to Manziel's people and offered him a chance to work out for teams. One less pass rusher on the market. Please KC, trade Houston to the Niners. I don't think I can stand it if they sign Fowler. I could! It'd be great! 2019: Best Season Ever! In all seriousness, Graham staying with the Eagles has gotta be the effect of letting Foles walk. Glad they kept him, he's their T-Sizzle. Ryan Colburn, FRESNO STATE! Not the greatest Bulldog QB ever. 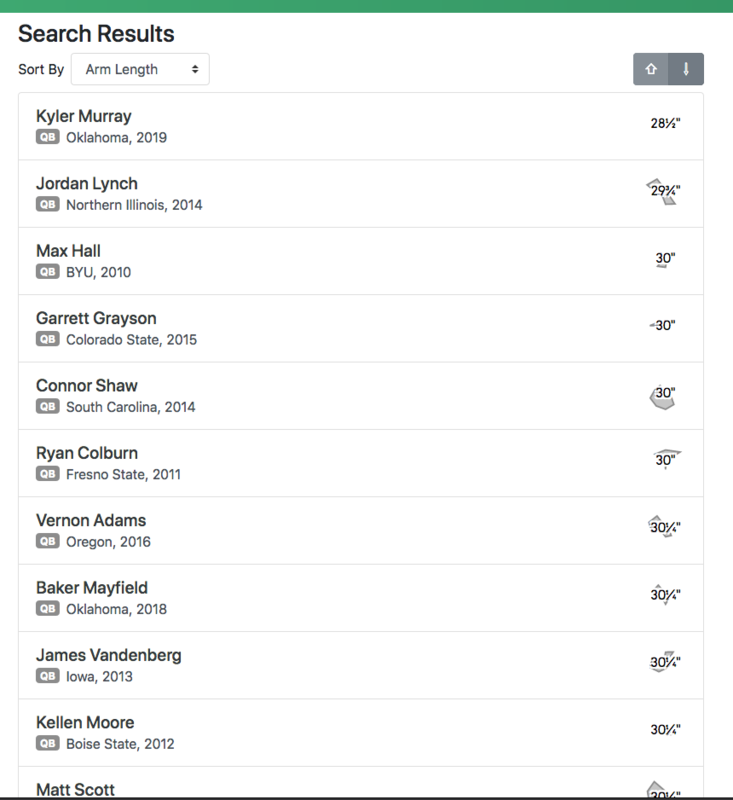 The only real notable names that make the first page of results are Baker Mayfield and, a little further down the page, BEAT HARD. Case Keenum is early on page 2 with 30 7/8". Wilson, Garoppolo, and Darnold follow shortly after at 31". Is three inches shorter a big deal? Per arm? Yeah. It has got to effect everything from velocity to release and receiving angle. I'd also posit that small hand size is pretty significant too. Especially in bad weather when small grip means more fumbles and less spirals. I’m thinking of the release point. 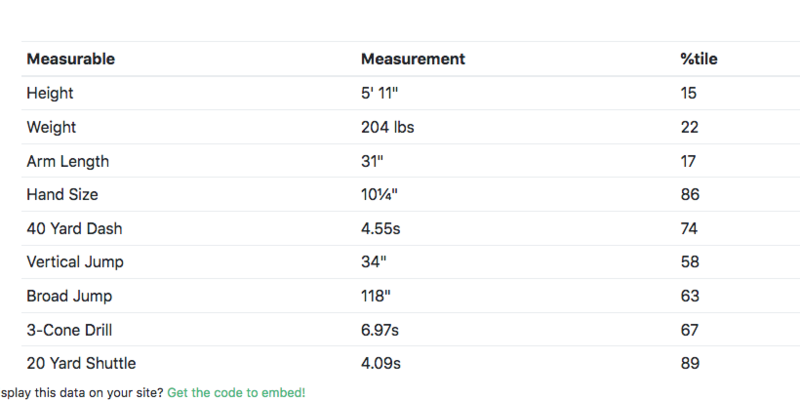 His arm is 2 1/2 inches shorter, and his height is 3/4 of an inch shorter. It is all a lot to make up for with accuracy and athleticism. Scheme has a lot to do with it, too. Saints (ugh) and Seahawks have figured it out. The team that drafts Murray will have to, too, unless they want to snap the ball to him 15 yards behind the line of scrimmage. 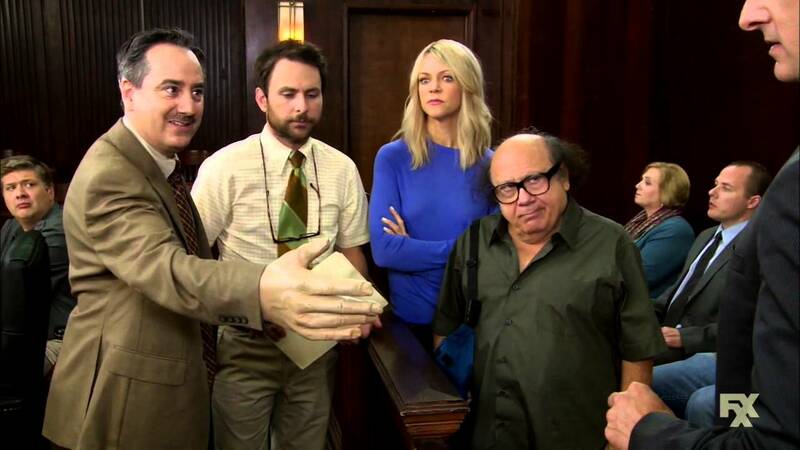 Also, Legion, you need to post ... QB HAND SIZES. That's the most fun part of the combine next to the O-linemen running their 40s. Batted passes has a lot to do with your o-line as well. Also, Legion, you need to post ... QB HAND SIZES. Is Rypien related to Mark? Yep. Nephew. And I hate him, because Boise.